Locate the lost plane in the LEGO® City jungle! Explore the mysterious wreck, then set up camp before you hop in the kayak to explore the temple downriver. Keep your eyes open, there are lots of animals and traps lurking in the jungle and ruins. Make sure you don't pull on the wrong vine — there are surprises everywhere in the LEGO City jungle! Price is 20% below the initial Lego retail price, a € 20.20 discount! 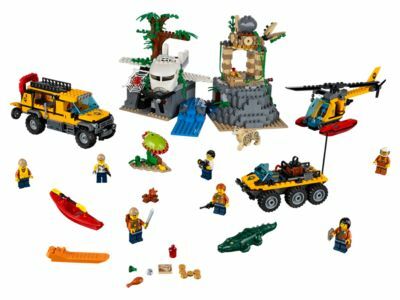 The Jungle Exploration Site (60161) Lego set is available from the sites below. However, they do not offer delivery to your selected region. The Jungle Exploration Site (60161) Lego set is no longer directly available from the sites below. However, 3rd party partners of these sites might still have the set available. Alternate description Discover the secrets of the jungle with the LEGO® City explorers!